but if you’re stuck at home, you can at least have a suitcase that’s been around the world (or the block at least). Vintage suitcases have so much character – the aged leather, the monograms, the travel stickers. you’d never see a pair of pink Juicy sweatpants on that woman with the beehive hairdo gliding through the airport in kitten heels and flouncy dress in 1952.
and will smell like springtime and butterflies (or at least won’t smell like mold and mildew) with these tips. 2) If your luggage is leather – be gentle and don’t scrub but if you have hard luggage, use an old toothbrush and mild cleanser (Simple Green) to get into the grooves around handles and latches. 4) Vacuum the inside of the suitcase with a hose attachment to get rid of years of travel memories – aka, dust, crumbs, random bugs and cobwebs. 5) Take the sniff test. If your luggage doesn’t pass, just set a bowl of baking soda inside and shut it for a few days. 6) Use your newly spiffed up luggage to store stuff or stack or do something crazy like take it on a trip to the Bahamas! P.S. Want to learn my secret tips for scoring the best vintage finds? Magic Erasers are the bomb, aren’t they? Love those puppies for so many cleaning chores. Thanks for the old luggage cleaning tips! Hugs!! Great ideas!! I never thought about the magic eraser. I have three pieces of vintage leather luggage that I love and don’t really want to part with. They have so much character. Great article!! Thanks! Timely post for me. I got a beauty at a barn sale this weekend. Super ideas! Love the bowl of baking soda. I’ve never personally encountered a Magic Eraser though I keep reading about it’s magical powers, LOL. Maybe there is one in my future! Sharing your post on Facebook and Pinterest where hopefully it will help others who love vintage luggage, too. Would have never thought to use a magic eraser ! Great tips Kelly!! Happy Trails! I finish it off with some Maguires leather cleaner too. Can’t beat the new leather smell and the nice shine. I love old luggage – there is so much you can do with it. great tips! i just bought some that was sort of icky and i tried goo gone and other cleaners and they just weren’t cutting it. never thought about magic eraser! Thanks so much for this. I have my mother’s two piece white leather luggage. She used it as a young WWII Bride on her honeymoon in New York with my Naval officer father. Very romantic. Now it will be very clean! My mom’s 1960’s luggage is the second to the bottom in your stack. She still uses the vanity case from time to time! I’m going to try out your baking soda tip on an old suitcase that I have in my attic that was my grandmother’s. It has the worst musty smell inside. I have a couple of old suitcases and don’t open them for reasons listed above. Great advice. Now how to get people to stop wearing their pajamas, or other attire with the name of the store stretched across their rear end. Sigh, one of my endless list of pet peeves. Perfect timing! I just bought a 1940’s steamer trunk off Craigslist that could use some love. The smell is the most difficult to remove sometimes hence has turned me off buying more! I will try these Kelly, thanks! Thanks for this! I just scored a great vanity case at a yard sale last month. I’m excited to try these tips before I load it up with odds & ends! I collect vintage luggage and I’ve gotten some that really smell, well, awful! I’ve tried the baking soda trick but it hasn’t worked for me! :( I’m still waiting to discover another trick that works. Never thought about using a Magic Eraser! oh no – you must have some die hard mustiness!! isn’t the magic eraser a great idea! Maybe vodka will do the trick. Spray it lightly with vodka and set it in the sun to dry. Repeat if needed. I have found that fresh coffee grounds works really well! I just place a bowl in the suitcase and shut it up for a few days and it does the trick. Try kitty litter to absorb the odors. 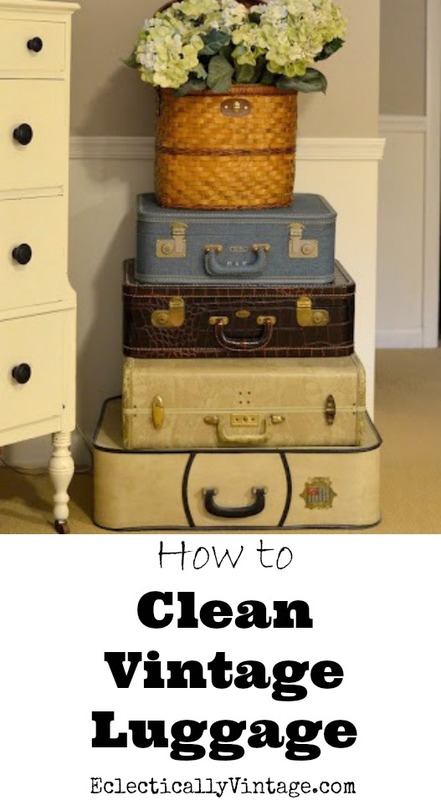 Great ideas, but do you know of anything to get mildew out of the inside of the suitcase? Thanks! Dorothy – try scrubbing the mildew lightly with a brush. Old fabric is delicate and could deteriorate with too much harshness. Try mixing 10% bleach with 90% water and applying it with a sponge. Let it dry in the sun. Hope that helps! So happy to find your article! I just scored about 10 pieces of vintage luggage and, after leaving them outside for two days, my husband and kids still gag at the smell when they walk in the backyard LOL he could never do my job working in the old homes on a regular basis! I have a whole set like the second from bottom in your picture.The handles especially are sticky and washing with a little soap did not help even a little. I don’t want to ruin the finish or color. I am afraid to use them for fear they will be handled too roughly and have no where to display them either.